Imagine, for a moment, that you have several rather large American metropolitan areas. Each has an active social folk dance community. They follow similar traditions, and have followed similar choreographies for a couple hundred years. It is a living tradition; every week, some 350 people from ages 8 to 80 and a live touring band crowd into a ballroom on a regular basis in just one of these cities. Each of these communities talks amongst itself -- social talk, yes, but also talks about dance, talks about how to build their community that they love so much so it'll stick around for another couple hundred years. But then, a tiny group in one of the cities has an idea -- what happens if, in addition to the dance with the live band, we had another dance, that kept the traditional dance steps but set it to a DJ and took the best parts of a club and mixed them with the best parts of this traditional dance? It's not an original thought, because someone in another one of the cities had a similar idea, and in fact they actually arranged such a thing monthly and a hundred people showed up. So how do we get these two people talking? How do they even know that the other person had this idea, too, and might even know how to implement it? And what about the bands? What if some of them take traditional tunes and start adding a synthesizer that one of the band members controls with his feet while he plays? Right now, this describes the contra dance community. Much of the organization through the years has been through word of mouth and, recently, Facebook. But I don't think I've seen any Facebook updates that say, "So-and-so is off forming new traditions." I think the community can do better. 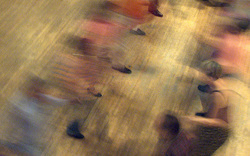 To that end, this is a web site for all of the contra dancers out there who have ever thought to themselves, "what if I added this to make this dance even cooler?" Or, better yet, "I added this, and it was really cool, and I want it to catch on! Come look!" It doesn't have to be as dramatic as techno contra, it can be all the swing dancers out there who pull out crazy leads during contra swings, or those people that turn balances into polka steps to make them go that much faster. Show us what you've got. Maybe it'll catch on, too.